More commonly known as bastes or basting sauces, mops are the true sauce of barbecue. These thin mixtures keep your barbecue and grilled foods moist and infuse them with flavor while you are cooking. And there are plenty of recipes to choose from, whether a simple sauce or a recipe infused with beer. Mops are added while the meats are smoking, either on the grill or in the smoker, using a barbecue mop tool rather than a basting brush. A mop tool looks like a miniature kitchen mop. The cotton strands help deposit the liquid mop sauce onto the meat without brushing away the rib rub. Apply the sauce in several thin layers to lock in moisture and build layers of flavor. By using a mop in combination with a barbecue rub, you will build a nice, outer crust on the meat. This is a great mop for all kinds of ribs, but can also be used with brisket and pork. You get the tenderizing power of the vinegar and a whole lot of flavor from the yellow mustard, chili and garlic powders, and cayenne pepper. It is best to make this mop a few hours ahead of time so the flavors have a chance to meld together. Beer combines with Worcestershire sauce, cider vinegar, onion, garlic, and cayenne to make a mop that will bring your brisket to a whole new level. All of the ingredients are mixed together and then cooked until unified. Plan to prep a day ahead so the ingredients have plenty of time to blend. This fantastic mop recipe works well on beef, but you can pretty much use it on anything else with delicious results. One of the star ingredients is fresh lemon, which contributes a nice tang while helping to tenderize the meat. Hot sauce adds a bit of spice, while chili powder and paprika bring a little smokiness and color to the beef. 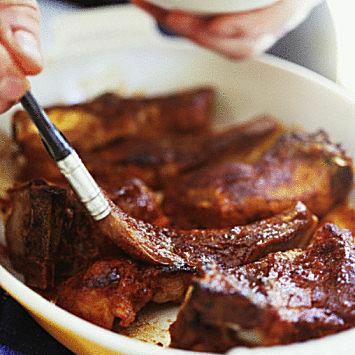 Whereas pork ribs may not need a lot of help in the taste department, beef ribs really benefit from a flavorful mop. Spices such as paprika, chili powder, cumin, and cayenne, combined with sugar, oregano, Worcestershire sauce, and soy sauce make for a mop loaded with complex flavor that tenderizes the ribs. This mildly sweet and spicy sauce is perfect for all rib-lovers. If you have had issues with dried out ribs in the past, using this mop is a sure-fire way to keep the ribs tender and moist during the smoking process. The dry mustard, onion and garlic powders, basil, paprika, and red pepper flakes, combined with water and vinegar, all work together to create a savory sauce that will take your smoking stature up a notch. An all-around mop ideal for large cuts of meat and chicken, this traditional Southern recipe includes only four ingredients—but ingredients with a punch. Apple cider vinegar, Worcestershire sauce, fresh lemon juice, and lots of black pepper work together to tenderize and bring a bit of zing to any smoked dish. The recipe makes 1 gallon of sauce; if you don't need this much, cut the recipe down by half. Instead of water, this mop recipe features beer as the liquid, adding another layer of flavor to your smoked beef brisket. This mixture will keep the meat tender, moist, and flavorful while cooking. Remember to apply the mop every 2 hours to help build up the delicious outer crust, also known as "bark." Although this mop is great on almost any cut of beef, the beefy flavor makes it a perfect partner for brisket. Beef broth and beer are the liquids here, and work together with Worcestershire, paprika, dry mustard, and garlic powder, while Tobasco and cayenne add a bit of spice. And best of all, no cooking required—just mix and mop. More often than not, a Memphis rib recipe will not include a mop and simply rely on the rub to do the job. But to guarantee a moist and tender rib, plus a great boost of flavor, adding a mop with vinegar and seasonings is a good move. This mop takes the recipe for a Memphis rub and turns it into a mop by adding vinegar and water. Lemon pepper, rosemary, thyme, and poultry seasoning add a nice herbal freshness to this mop, making it ideal for chicken and turkey, as well as pork. Cider vinegar ensures tenderness and a little crushed red pepper brings a touch of heat.